We have a new product on the platform: VIU (Korean variety shows, dramas and music programs) from Megamobile. Watch your favorite K-Drama with VIU! VIU offers fast, LEGAL and free streaming and downloading of Korean variety shows, dramas and music programs with English subtitles. Its 8,000 content hours are provided by top Korean broadcasters KBS, SBS, MBC and CJ E&M. English subtitles are available as early as eight hours after the initial telecast and it also allows user to download videos for offline viewing. For as low as P10*, VIU premium pay allows you to watch WITHOUT ads, with screen resolution of 720p and 1080p PLUS download upgrade from 1 video per day to up to unlimited video downloads daily. 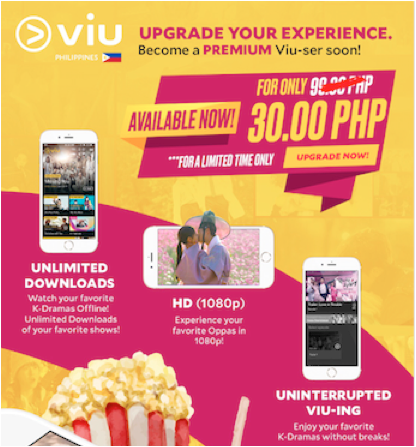 Just for LoadCentral buyers, VIU gives the introductory price of 1-month subscription for only P30 instead of P99! Don’t miss the FUN. DOWNLOAD VIU on Android or iOS now. Happy VIU-ing!